Organix Labs makes a very pure line of Colloidal Health Supplements that include NanoSilver, Zinc, Copper, Gold, Platinum and Magnesium minerals (or any custom brewed combo). For Cold & Flu Season, try our new NanoSilver + NanoZinc Colloidal combo. We have several lab approved, very easy to operate bench power supplies, to experiment in making all types of modern colloidal minerals. These systems all use our tried and proven colloidal production methods to easily make a 32 Oz. (1000 ml) batch of powerful micron sized Ionic Silver, Copper, Zinc and Magnesium LVDC supplies are not lab proven to produce true NanoGold. This section contains information and pricing on our NST high voltage packages. These systems and their accessories are only sold to advanced and very experienced Colloidal Producers. NST devices use highly advanced methods and require custom made arc bars and take several live electrode adjustments m-all which makes these devices very dangerous. 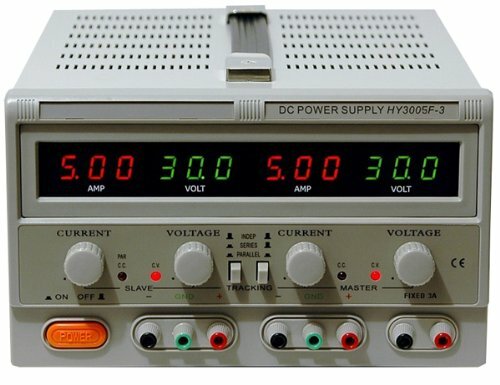 This section includes electrodes sets, extra QPC-32 and QUAD QPC, low and high voltage jumper lead sets, TDS Meter, True PPM u/S reading meters, test gear and other accessories. If you are paying by secure credit card or via a PayPal invoice based upon a quote you received, your card will be charged for the quoted price and that usually included the shipping cost added to your total. If you ordered via any ADD to Cart or BUY IT NOW link on our website, your shopping cart did not included the correct shipping cost and will be added later, after we pack up the products and weigh out your parcel. We ship Stateside and to International Customers and we ONLY use USPS or UPS, whichever is more economical. You only pay the exact same shipping rates we pay. We never charge for extra packaging or silly handling charges! We accept PayPal, Credit/Debit and for International Customers, we accept your VISA/MASTERCARD through your Verified PayPal account or direct bank wire. Such systems use highly advanced methods, that require the user to work with high voltage/high current power supplies. These NST systems are only sold to experimenters with advanced Lab and Electronics experience. by using basic LVDC Power supplies to experiment with recreating the Industry Standard low ppm Ionic based Silver, Zinc, Copper and Magnesium SAVE! Our systems work in the US and Internationally. 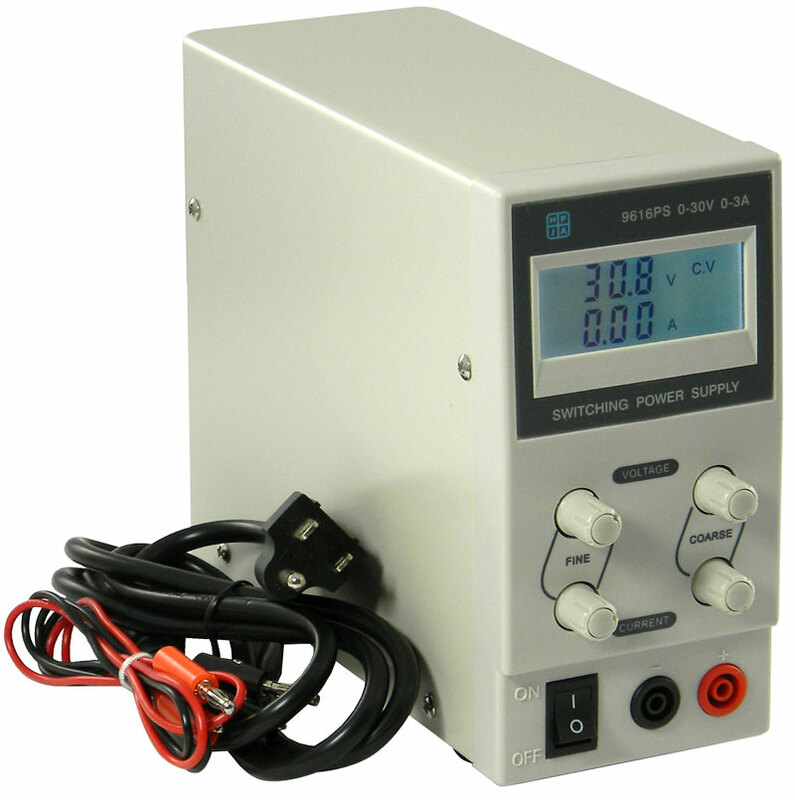 Very ECO FRIENDLY laboratory certified power supply - costs pennies to operate all day long! One Pair each: .9999 Silver Electrodes and .9999 Copper electrodes. Single heavy-duty lead set with universal alligator clips. Customer supplies the 16 to 32 oz production beaker, TDS batch meter and distilled water. **Can be chained for up to 10 simultaneous colloidal batches - please add stackable LEAD Sets and extra QPC beakers to this order to chain multiple batches for larger production. Don't forget your non heated, Magnetic Lab Stirrer. They help make your batches dispersed better and make an over all better product. Email us to order this product, we'll send you an itemized PAYPAL Invoice for you to look over and pay from securely. Please add your City, State, Country and Zip so we can figure out the exact shipping cost. You will never pay more than we pay for shipping! 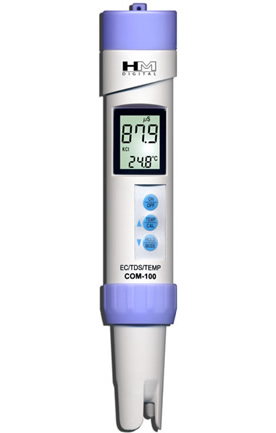 INCLUDES HANDHELD LCD PPM METER and QPC-32 Beaker with Electrode Holders for trye TSM Methods of Colloidal Production! One Pair each: .9999 Silver Electrodes and .9999 Copper electrodes. Single heavy-duty lead set with universal alligator clips. Customer supplies the 16 to 32 oz production beaker, distilled water. Special Order, one you make your verified payment, it will take 5 to 9 days to get the PS-500 in stock, so we can set it and bench test it. Single Port Output, but with optional QPC beakers and leadset patch cords, the PS-27 has the power available for the production of up to four simultaneous batches. 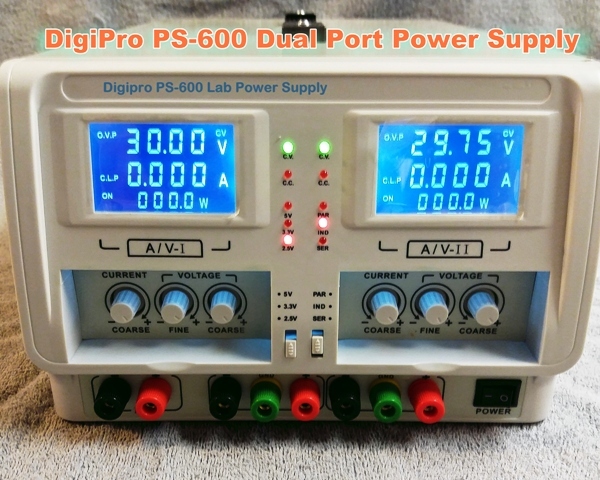 Buyer can upgrade the PS-27 package to include the Voltage convertor box that allows the PS-27 (and any 120v accesories) to operate on either 120 or 220V, add $95.00. Optional pairs of .999 Zinc Strips, Magnesium Strips and Platinum .9999 electrodes are available at a discount, but only when you purchase them with the original unit. This holds just under 1000ml of distilled water. 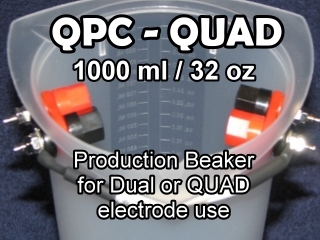 The QPC is a lab grade poly tripour beaker with a custom built in 5 way electrode binding posts. The QPC is great tool for proper TSM Colloidal Production. 220to 240 Users will require the 100 watt 220 to 110v voltage convertor, which is an extra $50 plus dollars. It also adds several pounds ti the parcel weight. Buyers can upgrade their QPC (which only requires one set of electrodes) to the more robust QPC-QUAD -which requires the user to use either 1 or 2 sets of electrodes from two different mounted 5 way binding posts as shown right. Using four electrodes instead of the standard two electrodes can help your batches progress by up to 25% faster and you will see higher potency outcomes. Adding the QUAD QPC automatically removes the standard QPC. If you add the QPC-Quad, you should also be purchasing the extra sets of electrode for your intended use. Upgrading to the QPC-QUAD is $20.00 extra. User only provides pure steam distilled water, coffee filter and funnel, new HDPE or Glass 500ml or 1000ml bottles for longterm storage. This system makes allot of product very cheaply. Show your love by brewing up a \batch of colloidal product and send a 16 oz bottle to your loved ones! Currently special order, once you make your verified payment, it will take 5 to 9 days to get the PS27 and Mag Mixer in stock, before we can bench test and set the units for colloidal, parameters. Model or Part # NEW for 2017! Dual Channel -means that you can run two simultaneous 1000ml batches with the included accessories, or more with optional QPC-32 batch containers, electrodes and stackable leadsets. DOES NOT INCLUDE the QPC-BEAKER or the TDS METER or distilled water. **Can be chained for up to 20 simultaneous colloidal batches - please add stackable LEAD Sets and extra QPC beakers to this order to chain multiple batches for larger production. Special Order, one you make your verified payment, it will take 5 to 9 days to get the PS-600 in stock, so we can set it and bench test it. Shipping is extra, email us with your City, Sate or Country so we can get you a proper quote. Here's what comes standard, saves you over $100 dollars! This is the Everything Included Package! We usually only need 1 working day to turn it around, add all your custom made accessories and get it shipped off to you! 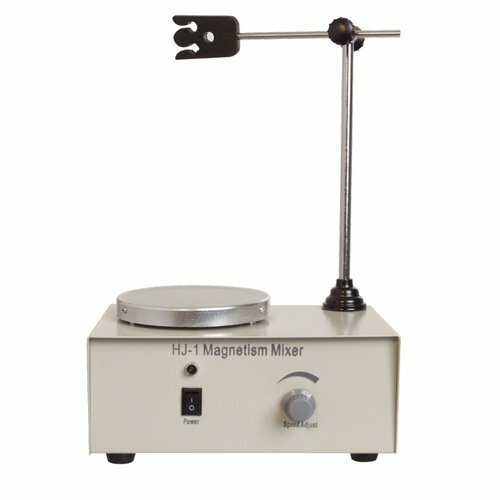 Do you want a real 220-240 Lab Grade Magnetic Stirrer system? Includes One Pair each: .9999 Silver Electrodes and .999 Copper electrodes. Single heavy-duty lead set with universal alligator clips. Dual Channel, you can run two simultaneous 1000ml batches with the included accessories. FOR US, Canada and MEXICO Customers, this system comes complete with a 110V Magnetic Stirring system, as shown left. International Users - you will have to buy at least a 100w 220-240 to 110V step down transformer to run the magnetic stirrer safely. Transformers are $65 and up depending on your Countries needs. 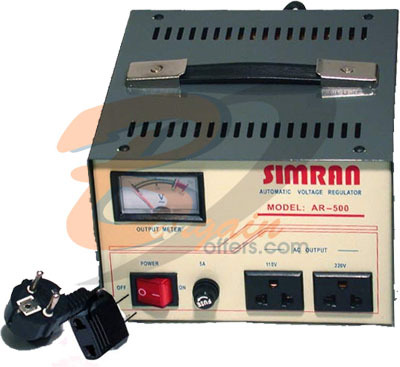 205-245 VAC 50/60 hz to 120 VAC 60 hz Automatic Voltage Stabilizer/Convertor. International Power Grid in the entire world. Unit is capable of producing 500 watts and can run other items such as 120 VAC aeration pumps, fans, etc. **Platinum & Gold are rising, we may not be able to honor the prices. We will contact you if there is any sudden increase/decrease. WARNING: FIRE DANGER on these bezels, no arc methods allowed to be used. for all LVDC through HVAC Systems (including exact fit other non-DIGIPRO models) Web View New Lower Prices! Double your Electrode density and surface area, make more potent batches about 15% faster! Same specifications as above, but has two sets of red/black electrode binding units allowing the colloidal producer to use a total of four electrodes. This adds double the electrode surface and produces a more potent, higher ppm colloidal batch. 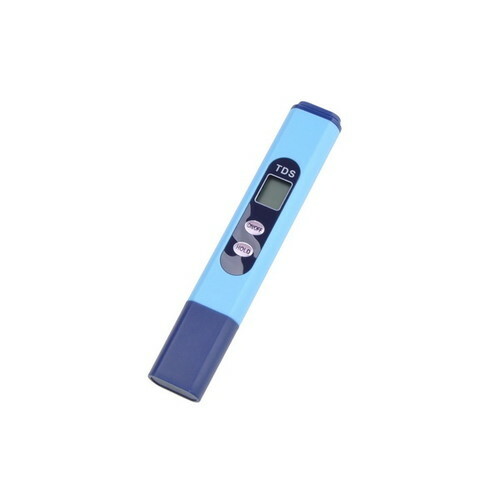 The HM Digital COM-100 Water Quality Tester is a combination electrical conductivity meter, TDS meter, and temperature reader all in one! 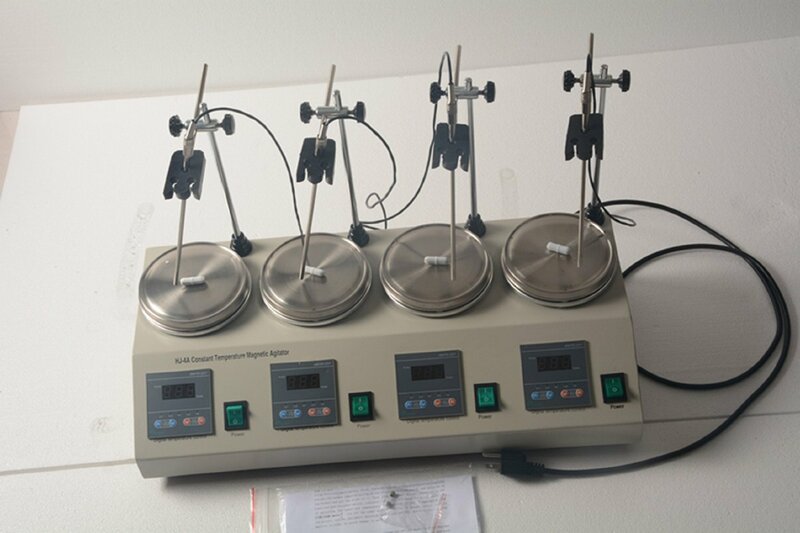 0-9999 ppm TDS Meters for measuring baseline distilled water quality and Colloidal Silver, Copper, ZInc and *Gold Ionic and *Particulate lab experiments. Certified for Tap, City, Well drinking water testing. *This device is not certified or calibrated for any Nano-Particulate colloidal testing. Please see our Advanced PWT above or the new triple meter above to test Nano Particulate and Ionic products. Ionic Colloidal Silver, Ionic Zinc, Ionic Copper and and to baseline test all your distilled and deionized waters before producing and brewing your batches of colloidal mineral product. INCLUDES BATTERIES (4 watch sized batteries) good for about 1 year! INCLUDES BATTERIES (watch sized batteries) good for about 1 year! If you have any questions about the products listed above, please email or call us. If you are an INTERNATIONAL CUSTOMER, please email us first, so we can figure out the exact shipping charges to your location, as the cart only reflect BASIC SHIPPING CHARGES and does not include handling/insurance for over Seas shipments. Before making any order, is is really important that you read through our Ordering Policies, which include important information about delivery, shipping, warranty and support.